In 1983, Isaac Asimov was asked to predict the world of 2019, 35 years into his future. It is weirdly disorienting to read his words, somewhat akin to reading George Orwell’s “1984” if you were around to enjoy that serendipity. He observed that three considerations should dominate their thoughts at the time; Nuclear war, Computerization and Space utilization. In looking at the future, it is important to consider not just what may change, but what may stay the same. Maybe what doesn’t kill us can make us stronger! Our research both explores new thinking and developments and occasionally creates them! We continue to challenge received wisdom with an open mind and we have developed our view on some of the key challenges, trends and opportunities that will absorb our time, and that of our customers, this year. We have had some robust discussion and debate with customers and business partners around the world, as well as leading lights in business, technology, sociology and philosophy! It is enlightening and exhilarating to absorb and consider as many perspectives as possible. Recent CFO surveys indicate that “growth” strategies are set to overtake process optimization as a CFO priority. However, this seems to slightly confuse an outcome with an enabling strategy. Transformation can be both a customer facing growth strategy and a scalability enabler, to ensure the business can serve the needs of the customer at the right cost. As such, transformation remains on the strategic agenda for CEOs and CFOs. We tend to talk about transformation as a pre-emptive strategy when in practice it is much more commonly a reaction to changing, challenging, even threatening, circumstances. Such transformations represent a fundamental reboot of a company, with the goal of achieving a dramatic improvement in performance in dynamic markets. But transformation is a much-abused term. Maybe this is the year of realisation. Transformation is often used to describe technology improvements, exploiting the latest tools to drive improved productivity. 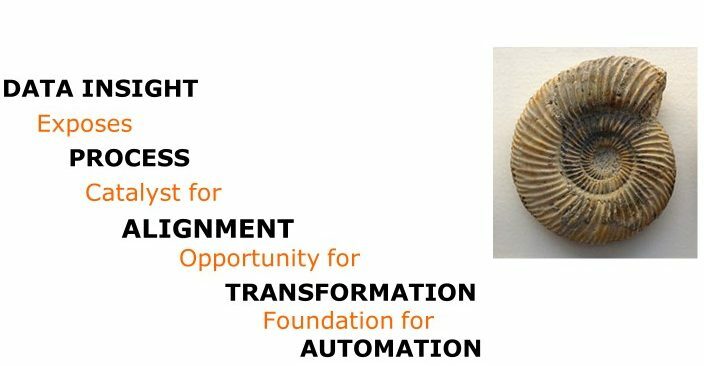 Whilst all progress is important, these are not the metamorphoses that the word ‘transformation’ describes. 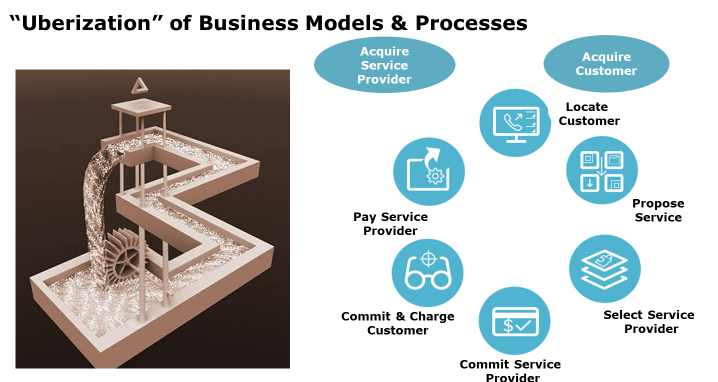 The growing evidence is that changing business models are what transforms business. Think about the ‘sharing’ economy of Netflix, Uber, AirBnB. The way in which these businesses view the consumer and their economic customer (not necessarily the same thing) represents a massive shift in business thinking and operation. Consumer convenience enabled by deep intimacy is driving even the oldest businesses to reconsider their models from classic Business to Business marketing and distribution, to a Business to Consumer (B2C) model. The biggest brands that rely on distribution networks are waking up to the fact that they need a direct connection to their consumer, even to survive, let alone thrive. I call this the “Uberization of business”. Driving consumer intimacy and convenience requires a standard operating model. Even the businesses we like to think of as the most entrepreneurial, operate their consumer facing processes with military precision. It becomes clear that all processes that drive consumer value, and one would hope that they all do directly or indirectly, need the same end-to-end attention. Apple easy”, “Google fast”, and “Amazon convenient” are great watchwords. 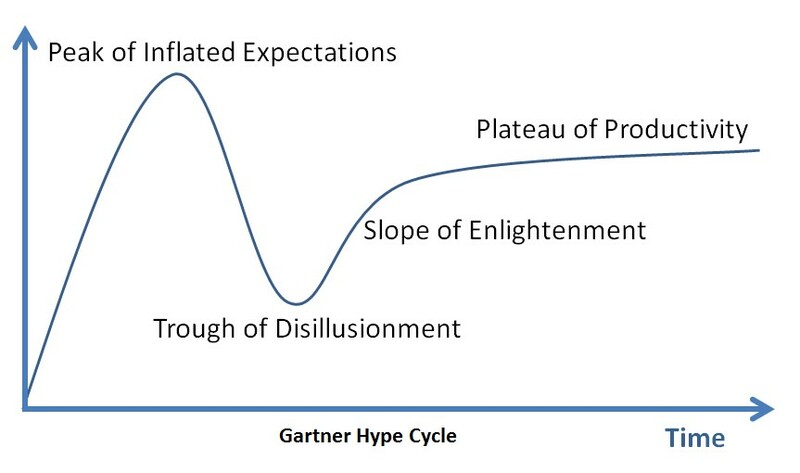 Harmonized, simplified, global processes are becoming a necessity not a trendy option. 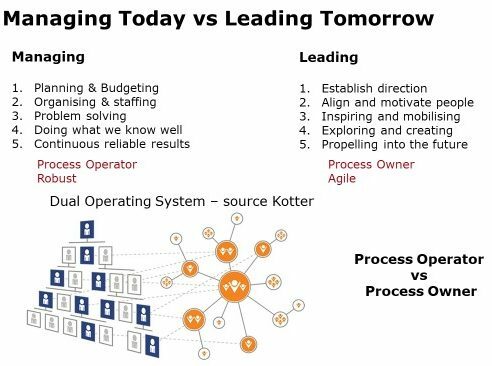 The global process drives a consistent consumer experience, and we will start to see the new Global Process Owner drive both operational excellence today and the new operating model of tomorrow. 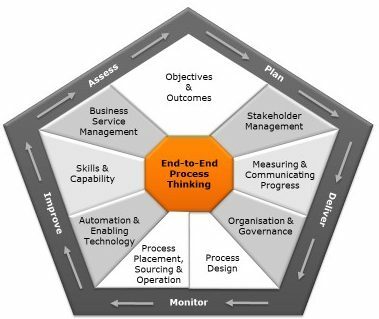 Common approaches to guide this ‘dual operating model’ of optimised process execution and transformation will emerge. Despite the agreement on the value of globally integrated, “end to end” processes, for many mature global businesses there is an ‘elephant in the room’. While we all ‘talk a good game’ there are still genuine barriers. 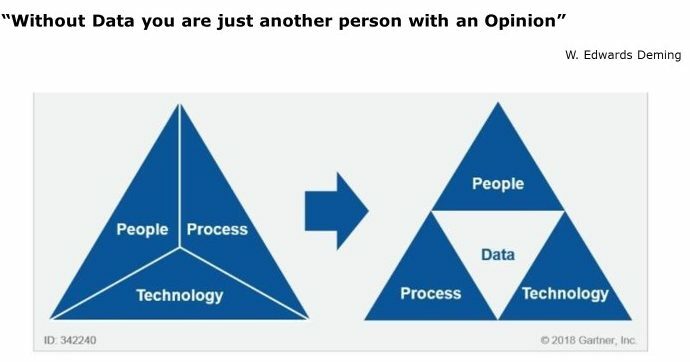 Effectively aligning sub-processes that are managed and operated by functions that have differing views of their own value, remains a massive change management challenge. The functional stovepipes of yesterday reinforce the siloed thinking, and functional leaders with different target outcomes and performance measures can be part of the problem. I had my eyes opened to an additional ‘drag’ on change momentum in this area recently, when I was reminded that the offshoring wave had moved much transactional effort to low cost locations, reinforcing the view that these activities were also low value. So ironically, the fact that our ‘strategic’ high cost activities are not co-located with the perceived ‘transactional activities’ has actually been a limiting factor in progress. 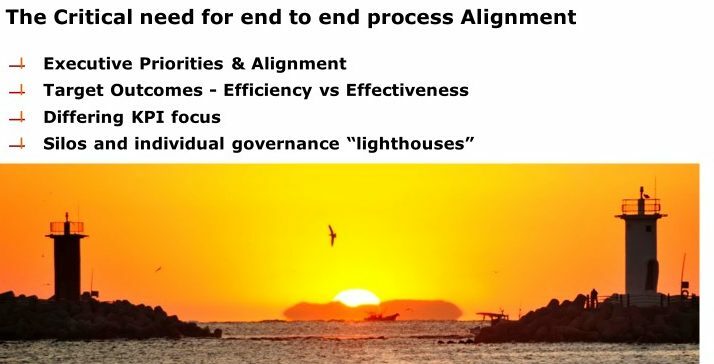 Alignment is essential for effective end-to-end processes, which themselves are critical for genuine transformation. So, the ‘chicken and egg’ problem is alive and well! Fraud and Cybercrime remain the highest reported systemic risks for CFOs, although economic headwinds, regional trade issues, and consumer demand concerns seem to be spiking as we enter 2019. Reports indicate that 62 per cent of businesses expect cyber risk to cause disruption within the next three years, yet nearly three-quarters reported poor cyber maturity. Cyber threats have also raised awareness of issues traditionally viewed as ‘internal’, not least the question of identity & authorised user access to corporate data and systems. This is no longer just a joiners, movers, leavers problem, as systems are ever more interconnected, with suppliers, subcontractors, operational partners, service providers and customers all having access in our streamlined end to end processes. This has led to some unfortunate breaches, and organisations becoming aware that up to 20% of the individuals currently authorised to access systems and data have either left their employer or are no longer appropriate for access. Culture & tone at the top has hit the headlines again in recent months, with CEO behaviour at Uber and others and the artist formerly known as Elon Musk getting into hot water on some “market moving” comments. Enterprise Risk Management (ERM) has been a long time maturing. We are moving from a world which has been dominated by policy and control, driven in large part by the compliance regimes of the last decade, towards a broader, more holistic approach to understanding and managing risk and opportunity in the business. With the emergence of so many compliance, regulatory and industry requirements, duplication of risk management and controls effort has become commonplace. 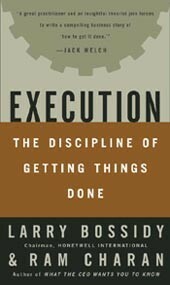 Now is the time to take a broader view and eliminate redundant or duplicated effort. Enterprise Risk Management (ERM) provides a stable framework for considering risk across the business, and is becoming the language of business decision making and recognising that risk is part of achieving any outcome. Our view of risk in today’s world needs to recognise that consumers, shareholders, other stakeholders and the world at large, have a growing keen interest in the ‘how’ as well as the ‘what’ of business. This means that financial results are no longer the sole measure of success. Ethics risk is no longer just about our own organisation, but the overall ecosystem including supply chains, service providers, manufacturers and distribution channels. Risk Management now really is a team game! 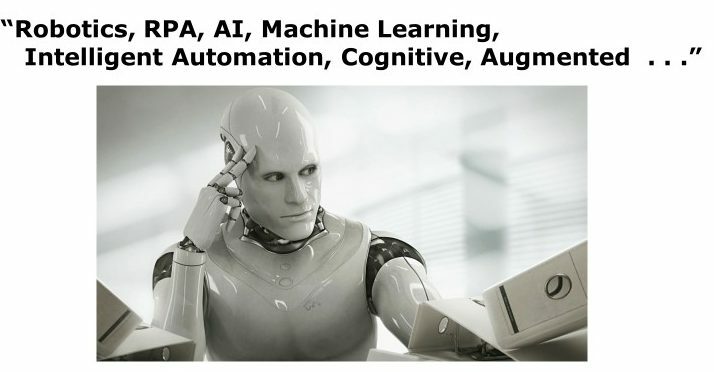 When it comes to technology for risk management, there is great interest and some excellent developments in the use of data analytics and process mining, AI and Machine Learning, and the application of Robotic Process Automation. Possibly stimulated by the need to maintain ‘buzzword relevance’, it seems that “ Integrated Risk Management” (IRM) is set to displace “Governance, Risk Management and Compliance” (GRC) as the guiding term for this discipline. I remain sceptical that there is any fundamental shift in thinking, but sometimes labels matter. But other than the psychological impact, does this label change actually offer any substantial advantage? There is a gap in skills between what we aspire to and what we are, and what we have. How will finance leaders re-invent themselves to embrace and exploit the full potential of new digital technologies, insights, intelligence, and analytics? But it is not just about the new tools and kit, but about a balance with new ways of thinking (innovation & acceleration) and ways of collaborating across the business. New roles such as business partnering are already widespread, but do we have the skills to do these well? Defining the future operating models will force us to work hard to identify the skills we need to hire, develop and retain in an environment where expectations on employment are changing. What are the skills we need in business operations as we extend the reach of global processes and advanced technologies? What is the role and limitation of the ‘gig economy’ in that context? How do we get the level of deep end to end business process skills and knowledge into our business? We need smart people who are “broad” as well as “deep”; these “T-shaped people” will always be in demand. They have the depth of expertise in one area, but they’ve got the breadth across lots of other domains as well. Thanks for reading and thanks and credit to contributions from our global customers, CFO.com, The Hackett Group, KPMG, Deloitte, PwC, SharedServicesLink.com, HfS Research, the FCPA Blog, IIA and apologies to anyone I have omitted!